The “green” trend or being aware of how we’re slashing through finite natural resources to devastating effects and seeking ways to stop/reverse the damage—is a growing movement. And for good reason. Earth Overshoot Day, the day of the year that marks when humanity has used up more resources than the Earth can replenish that year, fell on August 1 last year—the earliest date yet. Just recently young folks around the globe skipped school to stand up against climate change. More and more businesses are going green, whether through updating manufacturing practices, products, or even the buildings they reside in and customers are noticing. The green trend only stands to gain traction, as the environmental situation becomes direr and folks become more engaged in the fight against it—which is why all businesses should at least consider green marketing as part of their long-term strategy. Green marketing can wear a few faces, from being about the green initiatives at your business to sustainable/green-friendly products used in promotions and giveaways. If you opt to do something green, be sure you’re doing it authentically. Consumers are wising up and you stand to lose customers if you simply ‘go green’ because it’s on trend, and not because it’s part of your larger business values and beliefs. If you’re looking to create a promotional product but want to ditch the plastic and go greener, consider our curated list of the top 10 green marketing campaign ideas below. From reusable grocery bags, to stainless steel snack containers, to seeds (is there anything greener than a plant? ), we’ve got you covered! Plastic bags have become a major source of contention concerning the environment. They’re damaging marine life and filling up landfills — check out this list for 10 sobering facts on the problem with single use plastic bags. Be a part of the fight against single use plastic bags by gifting fully customizable reusable grocery bags. It’s been estimated that in the U.S., 1500 water bottles are used every second. Yikes! Help your customers go green by offering a reusable water bottle. Even better—ditch the plastic altogether with a stainless steel or glass version. These materials are much more easily recycled than reusable plastic versions. Ditching plastic bags is awesome, but even if you bring your own totes, chances are you’re still going to end up using plastic bags—cue the produce aisle, rife with cheap, small plastic bags. Cloth bags, made from sustainable materials like cotton, are a fantastic option to completely ditch plastic bags at the grocery store. Bar soap is a great option for replacing liquid soaps, which usually come in plastic bottles. A bar soap has no need for packaging, and eventually, gets all used up, creating zero waste. Get creative by customizing the soap by imprinting your company logo or name on it. Can you go greener than planting seeds? We think not. Seed packets are a cute, earth-friendly promotional gift that customers will love. They make a great gift for adults and are a family-friendly activity to do with kids. From herbs to wildflowers, there’s plenty of seed options out there. Straws, like the kind you get in almost every restaurant or fast food chain, are a big problem. The large majority are not recyclable, meaning they end up in landfills. But they’re so small, you may be thinking? Well, nothing is small when you consider that in the U.S. alone, 500 million straws are used daily! That’s a HUGE issue. Luckily folks are catching onto the wonder of reusable straws, made from materials like stainless steel and silicone. These straws are a major environmental win and can easily be branded with your company name or logo to make a great green gift. Finding ways to package lunches, which are eaten outside of the home (like at school or work), can be tricky if you want to be greener. Plastic baggies have been a long cultural norm for housing sandwiches and snack—but they are not green. Consider gifting a bento style lunch container as a promotional gift, which of course, you can customize with your company colors, logo, or name. Really want to make an impression? Fill it with snacks and other goodies when handing them out. A mug may not seem like the most innovative green gift, but the average coffee drinker consumes 3.1 cups per day! For those drinking those cups in the office using plastic, (or worse, Styrofoam) that’s an incredible amount of waste. A ceramic mug is the perfect solution to enjoy your coffee without the added cup waste. Customize your cup and consider incorporating something ‘green’ into the design to signify the goal of using it in the office as a replacement to paper cups. While a big part of going green is relying less on natural resources, it’s hard to completely let go of those, like paper. That said, you can use paper and be green by opting for a notebook made from recycled materials. Bamboo may be the wunderkind of going green. It grows quickly, uses very little water, and is wonderfully strong. It has promising versatility, too, from fabrics to building materials. Show some bamboo (and Mother Earth) love by gifting folks something made of bamboo, like a t-shirt, baseball cap, pen, or more (we told you it was versatile). Hopefully these Earth-friendly options have gotten your wheels turning for ways to gift promotional products that are wonderfully green. Looking for more ideas? 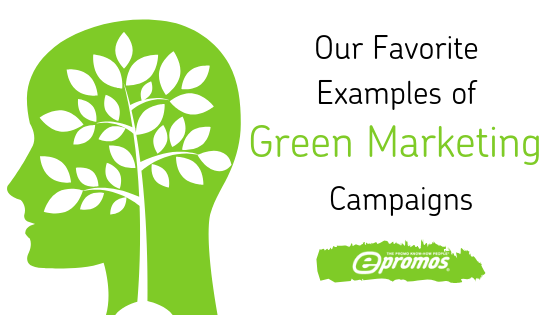 Check out this piece on 20 Creative Ideas for Earth Day Promotions. Taking a stand in the fight against climate change, and the disastrous issues that come with it, is something not only for your business to be proud of, but your customers will respect and potentially even support you further because of it.